W.E. Couplings Lancashire based factory comprises well equipped fabrication, hose fitting and machining shops. We have seven CNC and two manual horizontal lathes, capable of up to 750mm diameter over the saddle, and up to five meters between centers. The long oil country lathe also has a 14" open-center chuck to allow pass through. We have four vertical CNC machining centers with an up to 1800mm width bed-size allowance. We also have a large diameter sawing capability of up to 880mm, again set up to handle long lengths. tank drain and suction systems for all sizes and types of storage tank. When the medium in question is highly expensive and highly volatile, our superior quality and reliability is important to prevent contamination of the medium, or even potential ecological disaster in the event of a leak. These systems have been utilized all around the world, from airports here in the UK to huge storage farms in the middle east. W.E. Couplings manufacture a large range of fittings from various materials. Our main market sector up until recently was civil engineering, although now we have completed many contracts for the fuel & oil, agriculture and food industries. We are able to supply and test complete assemblies for all types of applications, and for sizes ranging from 1/4" to 24" bore. 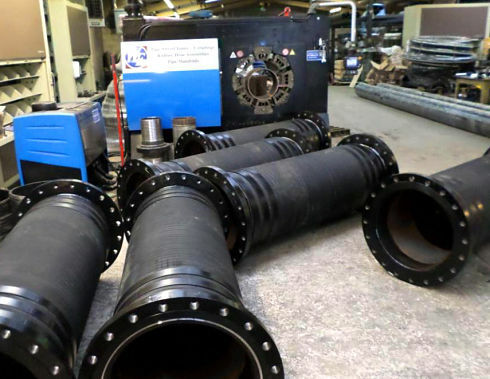 To our knowledge, we believe we have the largest swaging capacity in the world, with internal swaging to 12" (300mm) bore and external swaging to 24" (600mm). We currently have eight external swaging machines and five internal machines. We have direct access to various hose manufacturers and carry extensive stocks to facilitate a speedy turnaround service. We have also developed a highly specialised 'Layflat' swage, to which we have had exceptional results. One of our flagship products is the WESwivel joint - utilized in the articulated drain and floating suction systems. It is specially designed and manufactured to allow 360 degrees of low-friction rotation without reducing the through-bore at all. Available in a range of configurations, sizes and materials, it also comes with a customised seal configuration, depending on the medium, pressure and environment in which it will be used. coupling system for layflat hose. It comprises special tails and clamps that securely grip the layflat material without comprimising it's surface integrity, like a sharp serrated tail might. Available in 2 bolt (WEFlat21) and 5 bolt (WEFlat1200) versions, this coupling is designed to take the punishment of a layflat application, even in offshore and fuel handling environments. As with some of our other couplings, we can offer this system in Hard Anodised Aluminium material, providing the user with a superior corrosion resistance, at 65% of the weight of their steel counterparts. We have also designed and developed a quick-action, low profile coupling for steel pipes and flexible hoses which we have named the 'Dragline'; this trade name has been registered with the Patent Office. This hard-wearing, dynamic coupling has proved essential in a multitude of environments and applications internationally.